Pooley Bridge in the Lake District of England Attractions, Photos and Accommodation. Pooley Bridge is scenic small village situated at the north end of Ullswater Lake, in the Lake District National Park in England, about 5 miles southwest of the M6 at Penrith. The pier for the steamers is about 300 yards south of Pooley Bridge. 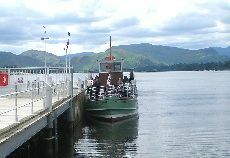 Pooley Bridge is popular for the Ullswater Steamers that run between the pier at Pooley Bridge and the pier at Glenridding, 8 miles southwest. Map. Donald Campbell broke the world water speed record on Ullswater Lake on the 23rd July 1955, in the Jet powered speedboat named Bluebird K7. One run in each direction over one mile, led to him setting a new world record averaging 202 mph. A number of outdoor activities around Ullswater include, walking, climbing, sailing, motor boats and fishing. More Information. There are a number of popular Camping Sites around Pooley Bridge and Ullswater, including the fairly large Park Foot Caravan, Lodges & Camping Park about half of a mile southwest, Park Foot Information, and the fairly large Hillcroft Caravan, Lodges & Camping Park about 300 yards from Pooley Bridge, Hillcroft Information. 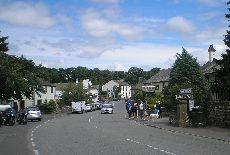 There is a popular 6 mile walk from Pooley Bridge heading south to a stone circle named The Cockpit. 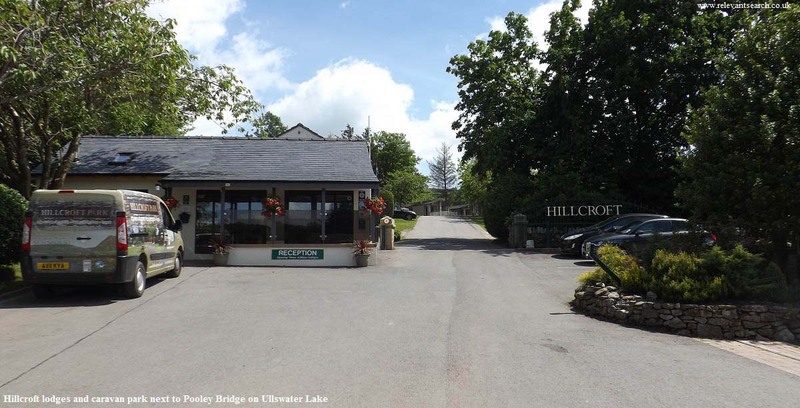 Pooley Bridge has 3 Inns / Hotels that all welcome non residents for drinks and meals, and have outdoor facilities. They are the Crown Inn at the small village square, Pooley Bridge Inn also at the square, and the Sun Inn about 50 yards north of the square. There is also a popular Tearoom named Granny Dowbekin's Tearooms. This tearoom is the first building you see after crossing the bridge into Pooley Bridge from the south, where the Pier for the Steamers is situated. More images of Pooley Bridge: The Bridge Itself . Riverside Beach . Beach & Beer Garden .